The Courtyard Roanoke Airport is the place to stay when visiting the beautiful Roanoke Valley. We are a newly renovated, upscale, award-winning hotel, only minutes from I-81 directly off of I-581 and only one mile from the Roanoke-Blacksburg Airport and Valley View Mall. Our hotel features a state-of-the-art lobby with inviting, flexible spaces for work or relaxation. The Courtyard by Marriott offers free Wi-Fi throughout the hotel. Use our GoBoard for an update on weather, flight status, or directions to restaurants. Join us in The Bistro - It provides guests with healthy food and beverage offerings in both the morning and evening. "We Proudly Brew Starbucks" is also featured in The Bistro. 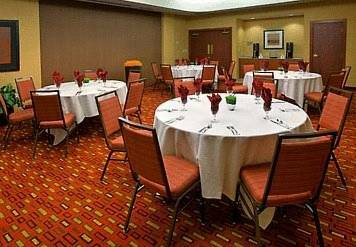 Our Roanoke hotel is near the Berglund Center, the Blue Ridge Parkway, Historic Downtown Roanoke, and the Taubman Museum of Art. We're less than an hour from Virginia Tech, Radford University, Ferrum College and Smith Mountain Lake.